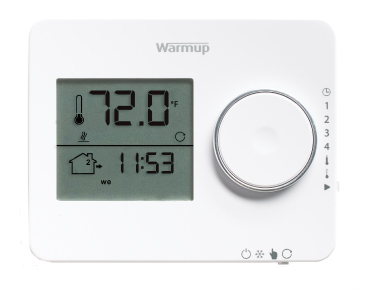 Warmup is excited to announce the latest addition to our programmable thermostat line. The Warmup Tempo thermostat provides energy-efficient programming features on a user-friendly display. For customers looking for an easy way to control the underfloor heating in their homes, the Tempo®thermostat is an affordable solution with a familiar interface. The Tempo® thermostat was delivered by our R&D team to address the need for an attractive and user-friendly programmable thermostat to be used with our underfloor heating cables. The thermostats turn dial operation is comparable to the original iPod design making its adoption virtually seamless for many consumers. Like our sophisticated 4iE® Smart thermostats, the Tempo® thermostat is designed to minimize energy usage. By simply following the suggested programming and Early-Start features, users can limit energy consumption while maintaining a comfortable space. The Tempo® is a line voltage thermostat that mounts horizontally and is suitable for 120 and 240 volt systems. The unit is designed to be used in conjunction with our underfloor heating cables and can handle a load of 15A. The thermostat has the capability to receive temperature input from the floor sensor or the unit’s built-in air sensor. To program, move the sliding levers on the right-hand side and along the bottom. To change the temperature, use the turn-and-click dial. If the space is vacant the unit can be switched to off mode or to frost protection mode depending on consumer needs. Selecting frost protection on the Tempo® thermostat will ensure that the heating target does not fall below 41°F (5°C). Where can I purchase the Tempo thermostat? The Tempo® thermostat is available at most Authorized Reseller locations. For a list of retail location please visit https://www.warmup.ca/store-locator or contact Warmup in Canada at 888-592-7687.